facing addiction on the national stage « AFTER THE POP ! 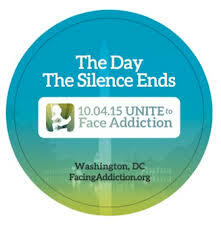 on october 4 2015, a modern “happening” is taking place in our capitol city and it is titled “unite to face addiction”. organizers are hoping the turnout of affected american citizens will be large enough to thoughtfully and decidedly start a new conversation about dealing with the overwhelming addiction problems throughout our nation. yesterday rolling stone magazine announced that some major entertainers from the music industry have signed on including joe walsh, steven tyler, sheryl crow, jon rzeznik, and the fray. undoubtedly the celebrity attractions will bring an additional number of souls to the parlez. as a country, we need to come up with something better than the samo-samo approach to our friends and relatives and neighbors forfeiting their future or dying. we all deserve better. and the somnambulistic approach of the last 30 years or so is broken. so consider spreading the word, attending the event, joining the conversation, and changing your intention. and please do it by october 4.
here is a repost of “the big vision” from the event toolbox download. On October 4, 2015 a transformative event will take place in Washington, DC that will ignite and grow an emerging national grassroots movement to solve the addiction crisis. In communities across the country, citizens are organizing and speaking out—about criminal justice reform, addiction recovery, health equity and deadly overdoses. The time has come to UNITE to Face Addiction at a national rally that will transform the conversation from problems to solutions for one of the most pressing health issues of our time. UNITE to Face Addiction is a grassroots advocacy initiative bringing together people, communities, and organizations working on solutions to the addiction crisis. We are mobilizing to let our nation know that addiction is preventable and treatable, that far too many of those affected have been incarcerated, and that people can and do get well. Addiction can no longer be ignored. Long-term recovery from addiction is a reality for over 23 million Americans, one of our nation’s best-kept secrets. Regardless of the paths people have chosen to achieve recovery, their lives and the lives of their families, friends, neighbors, co-workers and communities are vastly improved as a result. They are the living proof that there are real solutions to the devastation of addiction. While recovery from addiction is a reality for many, more than 350 Americans die from alcohol or other drugs on average each day—some 135,000 people each year—more than who die from either homicides or motor vehicle accidents. Another 22 million Americans are still suffering from addiction and the majority never receives any help. Why Come to Washington, DC on October 4th? Until now, a great majority of people connected to addiction have remained silent. Too many of those affected have been incarcerated, and for decades they and others have been afraid to speak up about the failed policies and poor care due to long-standing stigma and discriminatory public policies. The time is now to break that silence. Never before have tens of thousands of citizens stood up in the nation’s capital to speak with one voice about the public health crisis impacting more than 85 million of our fellow Americans. They are our friends, neighbors and loved ones. UNITE To Face Addiction is being organized by an independent coalition of national, state, and local non-profit organizations to produce a collaborative and unifying event to collectively raise awareness and reduce the human and social costs of addiction. http://www.facingaddiction.org. Check them out and share why you’ll be coming. The time has come to face addiction and stand up for recovery. This entry was posted in 2nd stage recovery, 2nd stage sobriety, emotional sobriety, life on life's terms, music, recovery and tagged advocacy, joe walsh, steven tyler addiction, unite to face addiction.